A boat tour along the famous Cliffs of Moher allows visitors cliffside views that are much more dramatic than from the land. Set sail along the Atlantic coast from Doolin, keeping an eye out for the resident puffins and snapping epic photo ops of the cliffs, a UNESCO World Heritage Site. Book your cruise ahead of time to avoid disappointment over sold-out sailings. 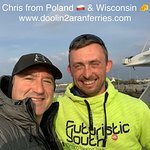 Make your way to Doolin's pier about 30 minutes prior to departure and board the boat for the 20-minute journey to the Cliffs of Moher. As you sail, listen to recorded audio commentary on the history and geology of the cliffs, created over years of relentless pounding by the waves of the wild Atlantic Ocean. As the boat approaches the UNESCO-listed cliffs, get your camera ready for views of the 800-foot (200-meter) rock shelves. An Bhreannan Mor, the largest sea stack, is best appreciated from a boat. Look out for puffins and thousands of other sea birds that nest on the rocky shelves. After about 20 minutes of cruising past the cliffs' seascape, return to Doolin pier. 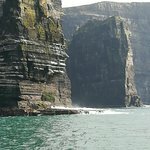 Loved the boat trip from Doolin. A lovely sunny evening. Enough waves to make theist trip exciting! Novel way to see the cliffs. 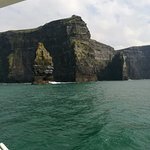 We greatly enjoyed this one-hour boat trip to see the cliffs from the sea, and it is very professionally run, with good attention paid to less mobile passengers and safety generally. Spectacular views of cliffs and huge stack, lots of good photos. 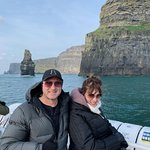 Took the trip to cliffs.what an awesome trip ,never seen the cliffs from the sea before ,thanks to the doolin ferrys (2)aran crew for a fabulous trip,really enjoyed it would Thoroughly recommend it. 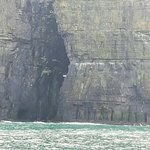 Get quick answers from Cliffs of Moher Cruise from Doolin staff and past visitors. How do you get to the pier from the city centre of Galway? Head east out of Galway and take N67. This road will take you south, then west (around the eastern end of Galway Bay). Follow the signs to Doolin and the pier. We took my five year nephew who has special needs and a special wheelchair/pram the staff were amazing. We mentioned it well before boarding just so they knew.